Poster Previews | Take Back Halloween! All of our posters are sized to fit standard frames and mats: 8×10, 11×14, and 18×24. They’ll be professionally printed on heavyweight premium luster paper and shipped to your door. Add a standard frame, with or without a mat, for an instant room enhancer. (For example, an 11×14 poster combined with a standard mat and a 16×20 frame makes a very nice-sized piece of art.) They make great gifts, too. We’re also making our posters available as digital downloads for you thrifty DIYers. The 8x10s are especially good for printing out yourself on photo paper. On each caption we’ve noted what size that particular poster comes in. Click the image to open up the largest preview size. 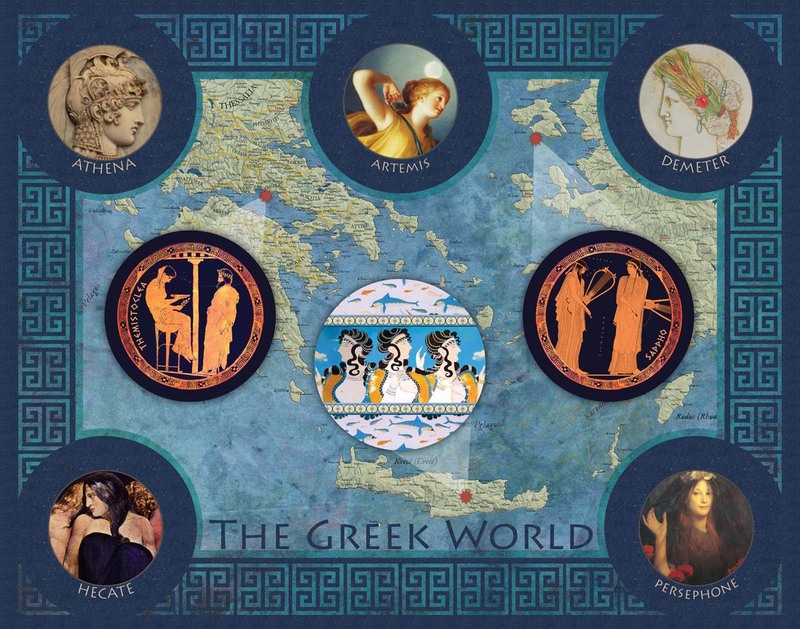 The Greek World: available as a digital download, 8×10 print, or 11×14 print. 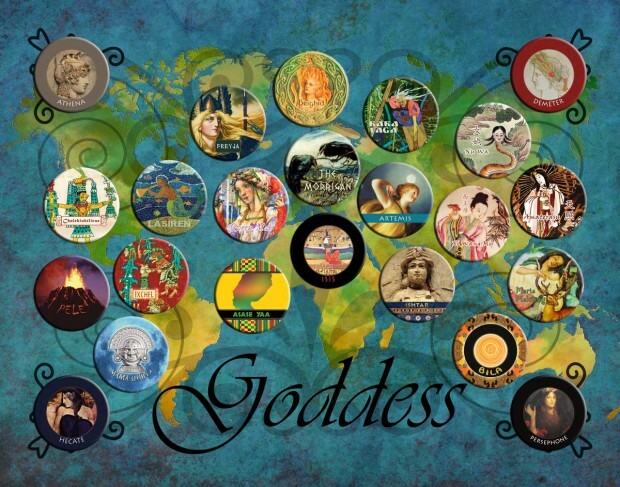 The Greek World: This poster features the goddesses and important women of the ancient Greek world, including the Minoan/Mycenaean civilization. The goddesses are arranged around the borders, with the Olympian goddesses up top and the chthonic goddesses at the bottom. Inside the map we have button-style portraits representing Themistoclea, Sappho, and the unnamed Minoan Queen, with stars pinpointing their positions on the map. Themistoclea’s portrait is taken from a red-figure vase depicting the Oracle at Delphi, with the seated Pythia approached by a male questioner. (Themistoclea, who taught Pythagoras, is believed to have served as a Pythia.) Sappho is copied from a famous red-figure vase showing Sappho and Alcaeus. The Minoan button is a tiny little mosaic we created using the restored wall paintings from Knossos. Unlike the ancient portraits of the women, the goddesses (who are timeless!) are all represented with more modern depictions. Hecate is by William Blake. Medusa is of course by Caravaggio. Persephone is from Death the Bride by Thomas Cooper Gotch. Artemis (Diana) is by Anton Raphael Mengs. The plaques of Athena and Demeter are both decorative pieces, we think 19th century. Women of Science: available as a digital download, 8×10 print, or 11×14 print. 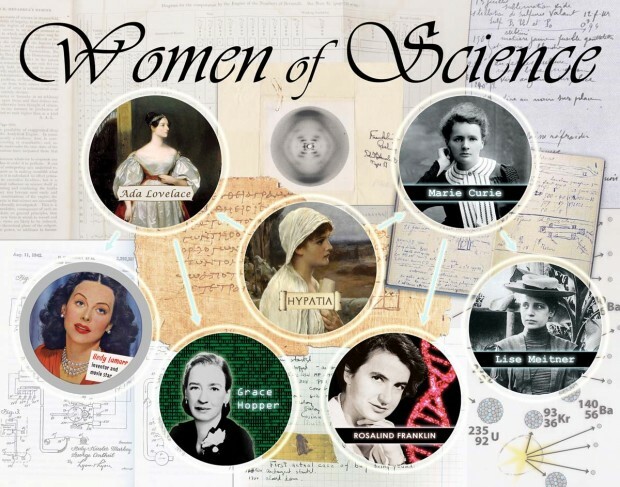 Women of Science: This poster features Hypatia, Ada Lovelace, Marie Curie, Lise Meitner, Grace Hopper, Hedy Lamarr, and Rosalind Franklin. The directional arrows indicate lines of influence, with Hypatia at the base as the woman who helped preserve Greek mathematics and science for future generations. One line of influence leads to the computer revolution (Ada Lovelace, Grace Hopper, and Hedy Lamarr), while another leads to breakthroughs in physics and chemistry (Marie Curie, Lise Meitner, and Rosalind Franklin). The background images all reference these women’s work: a fragment of Euclidean geometry on papyrus; pages from Marie Curie’s notebooks; a diagram of the nuclear fission process discovered by Lise Meitner; Rosalind Franklin’s Photo 51 of the DNA molecule; Ada Lovelace’s published notes on the Analytical Engine; Hedy Lamarr’s patent for frequency hopping; and the log book showing the first actual computer bug (a moth) found in the Harvard Mark II computer, programmed by Grace Hopper. Women of Words: available as a digital download, 8×10 print, or 11×14 print. 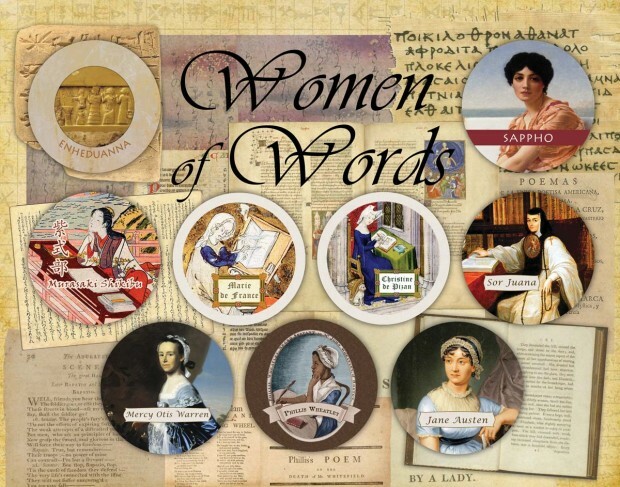 Women of Words: This poster features nine great literary women through the ages, beginning with Enheduanna, the Sumerian poet-priestess who was the first known author in history. 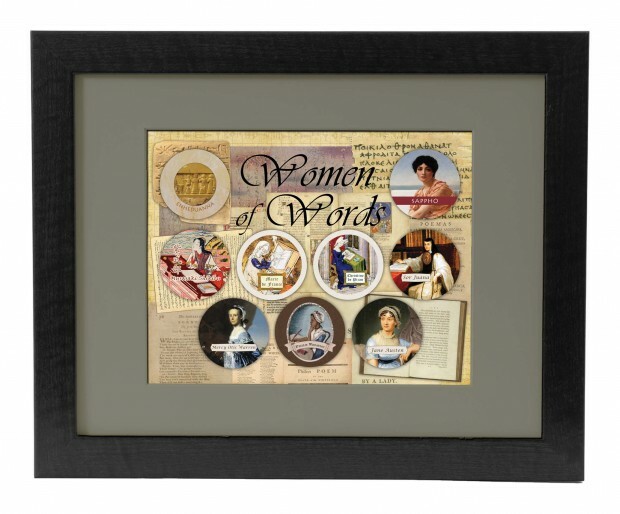 The other featured women are Sappho, Murasaki Shikibu, Marie de France, Christine de Pizan, Sor Juana, Mercy Otis Warren, Phillis Wheatley, and Jane Austen. The background images include a cuneiform tablet listing the names of Sumerian deities, dated to approximately Enheduanna’s time; a scrap of Sappho’s poetry in ancient Greek; an illustrated handscroll of Murasaki Shikibu’s Tale of Genji, as well as pages from a bound book of the same; a page from an illuminated manuscript of Yonec, by Marie de France; leaves from Queen Isabeau’s illuminated manuscript of the collected works of Christine de Pizan; the title page of the collected poems of Sor Juana; a page from The Adulateur, a political satire by Mercy Otis Warren; Phillis Wheatley’s elegy “On the Death of Mr. Whitefield,” published when she was 17 (and still a slave); the title page from the first edition of Jane Austen’s Sense and Sensibility, and a first edition of Pride and Prejudice. 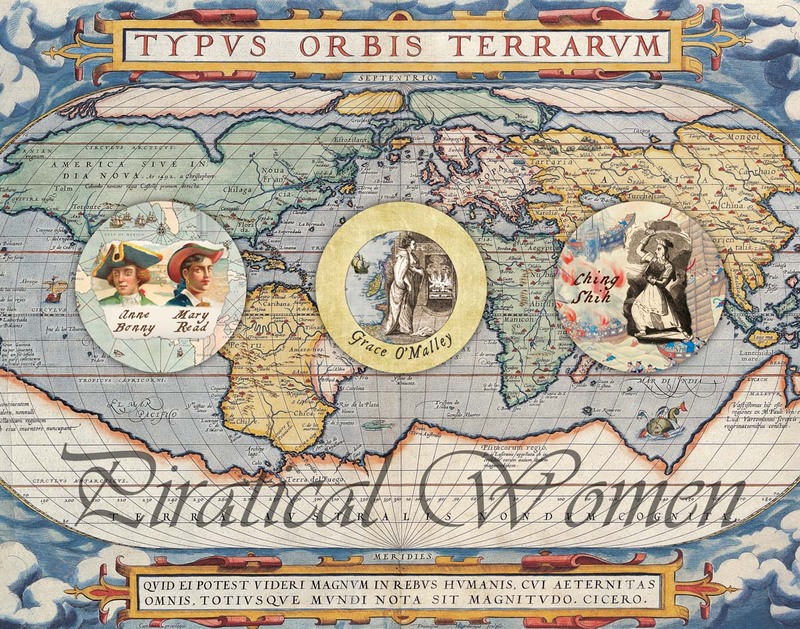 Piratical Women: available as a digital download, 8×10 print, or 11×14 print. American Heroines: available as a digital download, 8×10 print, or 11×14 print. 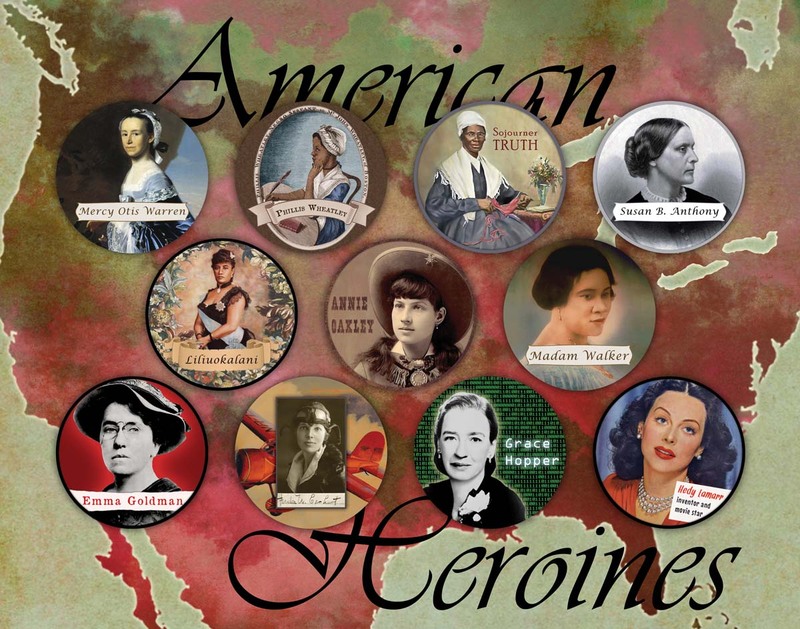 American Heroines: This poster features Mercy Otis Warren, Phillis Wheatley, Sojourner Truth, Susan B. Anthony, Queen Liliuokalani, Annie Oakley, Madam Walker, Emma Goldman, Amelia Earhart, Grace Hopper, and Hedy Lamarr. Their portraits are arranged in chronological order, beginning at the top left. The background is an impressionistic map of the United States. Goddess: available as a digital download, an 11×14 print, or an 18×24 print. Goddess: This poster features all of the goddesses in our catalog, as well as our planned 2014 additions of Maria Makiling, Inanna-Ishtar, and Hecate. The portraits are arranged trompe l’oeil style as buttons scattered on a map of the world. 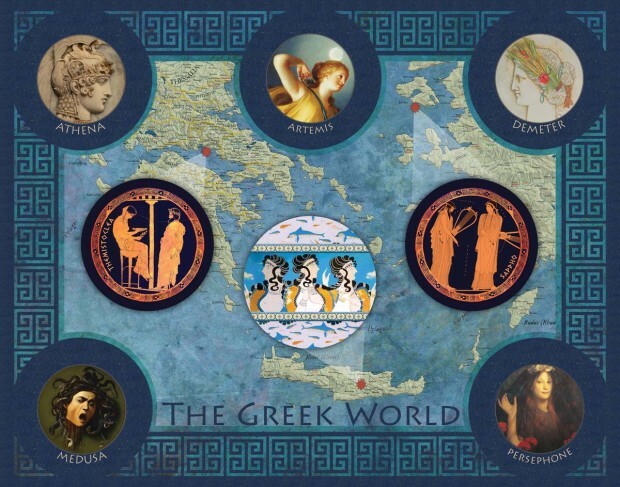 We have too many Greek goddesses to crowd into Europe, so we arranged a quartet of them in the corners of the map. Two Olympian goddesses are paired with their chthonic counterparts: Athena (above left) with Hecate (below left), and Demeter (above right) with Persephone (below right). 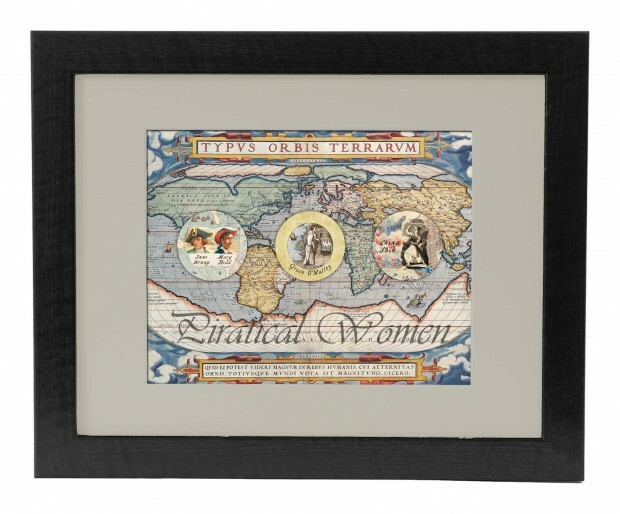 Timeline of Women in World History: available as a digital download or an 18×24 print. 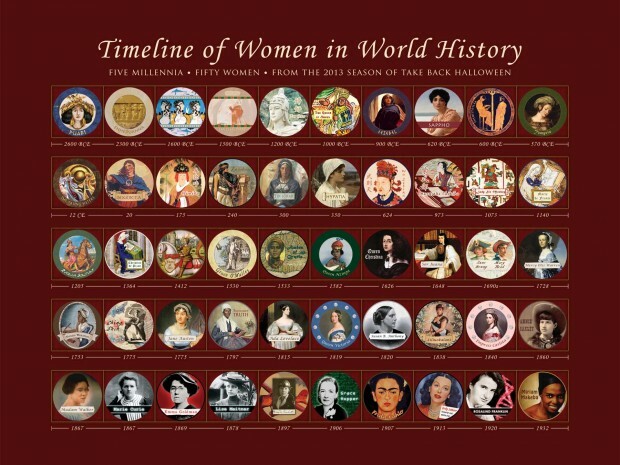 Timeline of Women in World History: This poster features 50 women through five millennia of history, and was originally created as a reward for backers of our first Kickstarter. It includes all the Notable Women and Queens who were in our costume catalog as of the 2013 season (excluding Lizzie Borden, who didn’t make the cut). All the women’s portraits are arranged in chronological order, beginning with Queen Puabi (ca. 2600 BCE) and ending with Miriam Makeba (born 1932). We created some mock-ups to see how our posters would look with different mat colors. These are just mock-ups! The actual reward posters we send are unframed. We started doing this to figure out what mat colors would be good, and realized it would work to help show people how nice these posters can look. Just add a black walnut frame from Michaels and a standard mat. This is a mock-up of our Greek World poster (11×14) in a matted 16×20 frame. 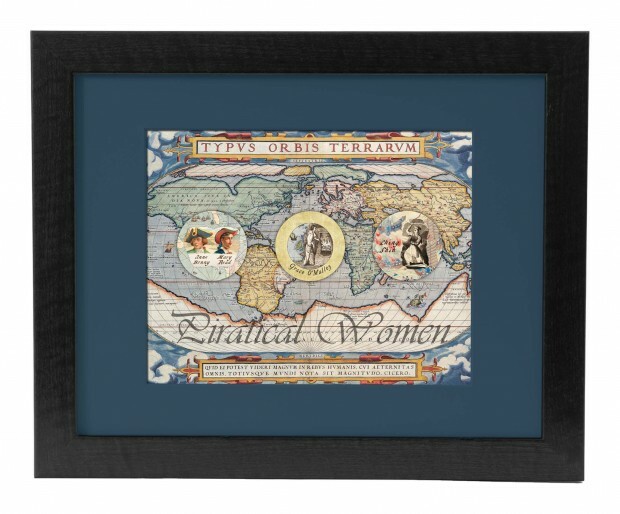 This is a mock-up of our Piratical Women poster (11×14) in a matted 16×20 frame. 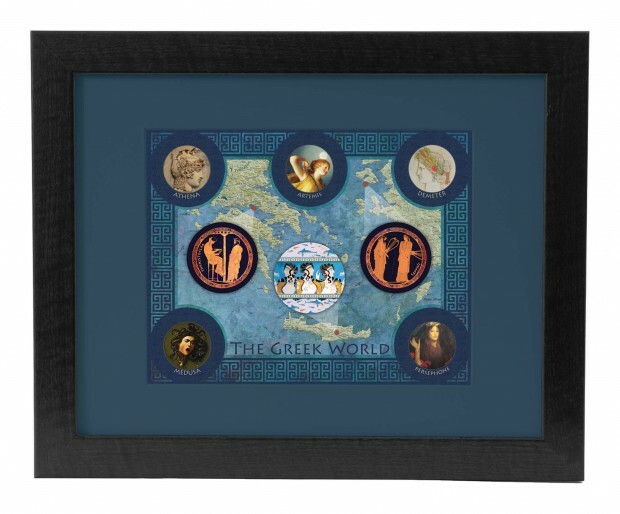 The mat color is the same as with the Greek World poster. 16×20 frame with a light-colored mat. This is a mock-up of our Women of Words poster (11×14) in a matted 16×20 frame. 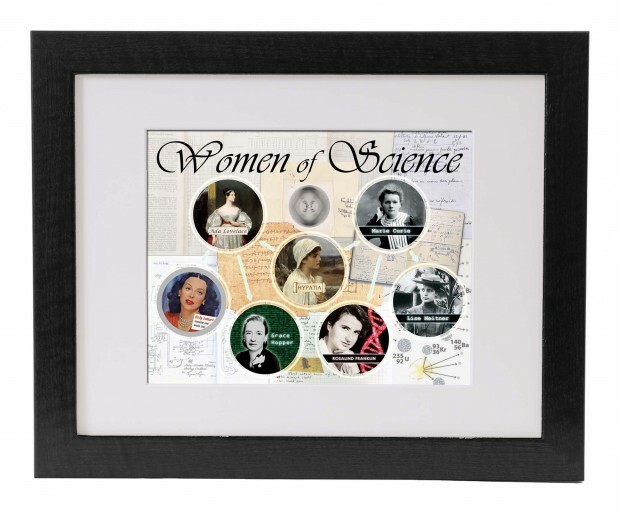 This is a mock-up of our Women of Science poster (11×14) in a matted 16×20 frame. 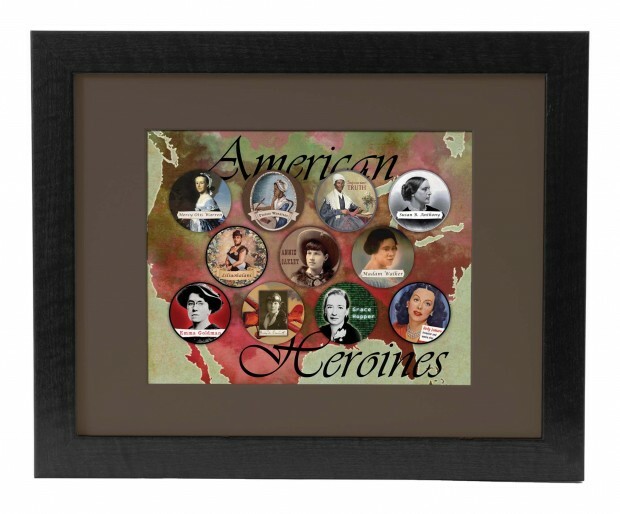 This is a mock-up of our American Heroines poster (11×14) in a matted 16×20 frame.